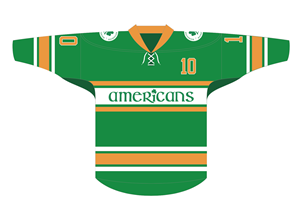 The Amerks will wear special Irish-themed jerseys. The Rochester Americans announced that the team will host Irish Night presented by DDS Companies benefitting the St. Patrick’s Day Committee on Friday, March 8 when the team hosts the Bridgeport Sound Tigers at 7:05 p.m. The Blue Cross Arena. Start your St. Patrick’s Day festivities off right with the Amerks, who will again wear special Irish-themed jerseys and matching socks for the game that will be auctioned off in the main concourse to benefit the St. Patrick’s Day Committee. Winners will receive the “jerseys off the backs” of the players following the game. Irish Night T-Shirt packages will also be available. For just $30, fans can purchase a specialty St. Patrick’s Day T-shirt, along with one best-available ticket. Additional tickets begin as low as just $14. The packages can be purchased online at www.amerks.com/irish, in person at the Amerks office, or by phone at 1-855-GO-AMERKS (while supplies last). Be the first to comment on "Amerks plan Irish Night on March 8"